The study was a large admission screening project for ESBL Enterobacteriaceae (ESBL-E), including more than 4000 admissions recruited over 14 weeks. Since the study was classified as research, each patient had to be individually consented into the study. If you have been involved in consenting patients into a clinical study, you will understand what an epic achievement it was for Elie (the lead author on the paper) and her team of swabbers to recruit around 400 patients per week once the study got up and running! The study included a diagnostic comparison of rectal and perineal swabs. Each patient recruited into the study was asked for a rectal and perineal swab. If they didn’t fancy a rectal swab, then they could choose to provide a perineal swab only. Also, they chose whether to collect the swabs themselves, or have the staff member collect the swabs. As you can see from Figure 1 below, rectal swab were around twice as sensitive as perineal swabs for detecting ESBL-E carriage (7.8% of 4006 vs. 3.8% of 4006, p<0.001). Part of this may be the challenges of identifying exactly where perineal swabs should be collected from! Also, staff-collected swabs detected more ESBL-E than patient-collected swabs (especially for perineal swabs). However, we did not take patient and staff collected swabs from each patient in parallel, so further work is required to confirm the data around patient or staff collected swabs. So, rectal swabs are the way to go, and self-collection may be an option to improve participation. ethnicity was not a significant factor. This seems hugely significant to me. We place a great weight of credence and importance on risk factors for the carriage of antibiotic-resistant bacteria derived from prevalence studies (and rightly so – it helps in determining who to screen and what to do with them). However, many of the factors that are commonly identified as risk factors for antibiotic-resistant bacteria were found to be associated with patients declining to participate in this prevalence study (especially age and gender). 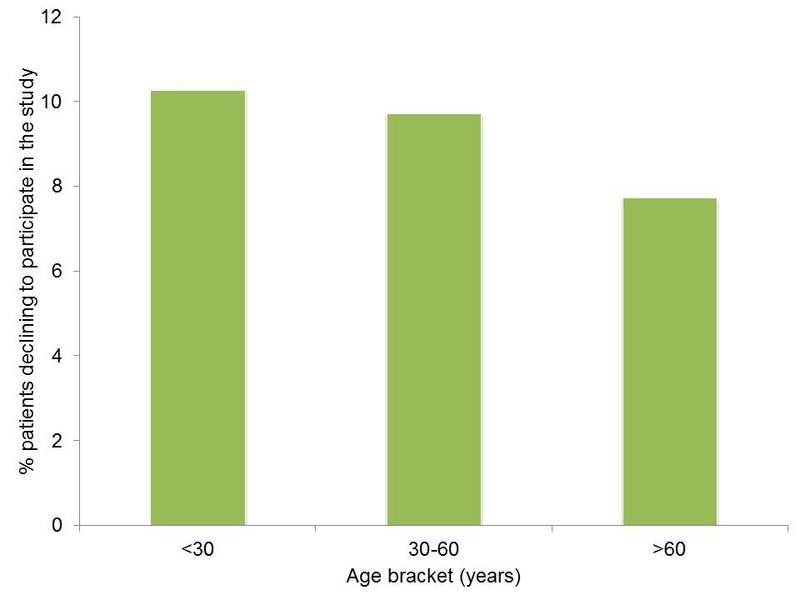 So, older age is a common risk factor for carrying antibiotic resistant bacteria – but could this be driven, at least in part, by the fact that younger patients are less likely to provide a rectal swab? We also found that the individual staff member consenting the patient was significantly associated with whether or not they agreed to participate in the study. In fact, the proportion of patients declining by individual staff member ranged from 0-83%! 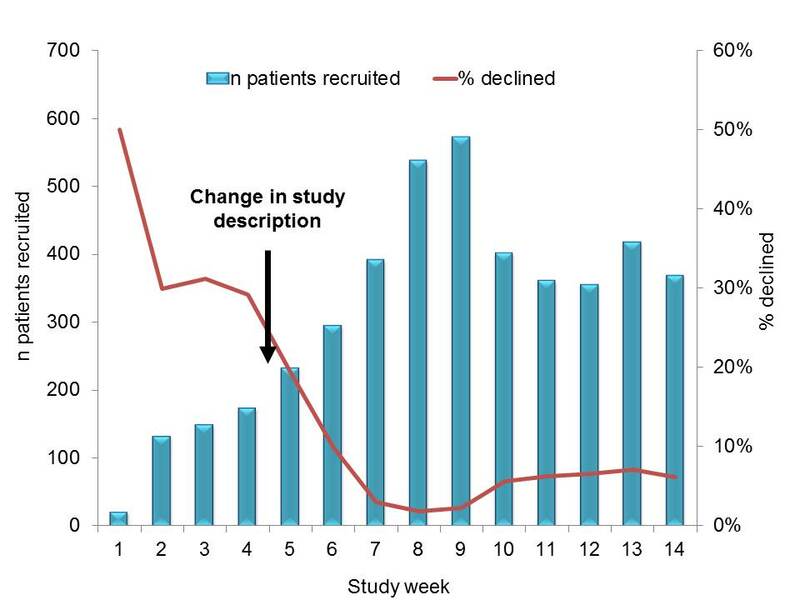 I spent time on the wards with each new recruiter when the joined the study team observing their message to the patient – and there was huge variability in the way that staff approached patients, so I wasn’t surprised to see this range in rate of decline by staff member. Related to this, we learnt a lot from the rocky start to the project. The rate of decline after the 1st week of the study was a whopping 50%! At that rate, it would have taken years to reach our target sample size of patients. So, we decided to look carefully at the training of staff and the message to the patient. Over the next three weeks, we reviewed what we were telling staff and patients, and developed a much simpler message focussed on the benefit to the individual and their peers, which was less ‘bug’ focussed. This new message was launched in week 5, and the impact was immediate and sustained (see Figure 3 below). Whilst we had quite a bit of staff turnover, which may have contributed to this reduced decline rate, both the individual staff member and the change in message were introduced as independent variables in the multivariable analysis, and both were significantly associated with declining to participate in the study. It was reassuring that very few patients (3.5%) chose to provide a perineal swab only – suggesting that rectal swabs are not unacceptable to patients (or indeed staff) if the messaging is optimised. In summary then, pre-analytical factors are a vital and perhaps under-recognised driver for the outcomes of prevalence studies around the carriage of antibiotic-resistant bacteria. Rectal swabs are far superior to perineal swabs, and should be the only sample type for detecting resistant Enterobacteriaceae when a stool sample isn’t feasible. Patient collection of swabs may be an option, but staff collection is best. Finally, clear messaging to staff and patients is crucial in obtaining good uptake when sampling patients for the carriage of antibiotic-resistant bacteria.